'Eat your own Dogfood' - don't propose a product/service that you do not use yourself! Always be asking - never leave a meeting without asking for an order, the next meeting, the path forward, etc. Before every sales appointment have a good night's sleep - go into every meeting full of energy, enthusiasm and a fresh face! Buying cycles are 40% longer in tough economic times - make sure that you have the pipeline to cover this. Don't chase every opportunity - thoroughly qualify beforehand and focus on the best opportunities. Save time by chasing everything and pour that time, effort and resource into the sales that you really want to win. Ensure all ongoing contracts, like maintenance contracts., have a review date. Increase prices gradually in line with your own service providers - maintain your bottom line. Go to the University of the Car! You spend more time in your car than the average university undergraduate spends at lectures. Spend this time wisely by listening to audio books rather than the radio. For £7.49 a month you can download any book from audible.co.uk (even those that cost £80) AND you'll get a free ipod! 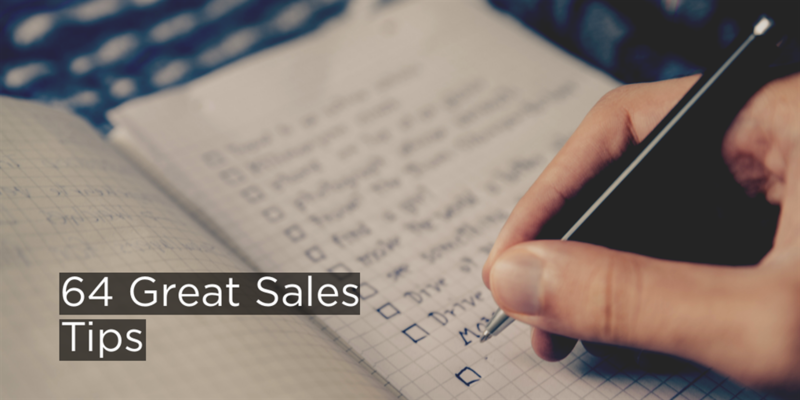 Listen to sales tips on the way to every sales meeting. Keep in contact - Xmas cards, thank you cards - always keep your brand alive in your client's mind. Know your numbers - keep a record of calls to appointments, appointments to quote and quote to margin (sale). If your ratio is 4 appointments to a sale then you can cope with 3 successive rejections easier as statistically your next meeting will be a sale! Make sure that your premises and car are clean and tidy - first impressions count and good buyers will check the state of your car as you pull into their car park! Persevere - always keep going but more importantly make every call as fresh as your first. Personalise every sales correspondence that you send - email, letters, etc. If you send standard mails personalise them around the conversations that you've had. Quote with trust. Put yourself in your client's shoes - does what you are proposing offer value? Remember that the person that 'orders' the work isn't always the one that 'authorises' the work. Sell safety and reliability - sell the financial stability of your business , offer guarantees and detail your product reliability - sell on safety. In tough economic times buying decisions are more frequently made by committee and wrong buying decisions are scrutinised more carefully. 4 out of 5 will pay more if the chances of a successful result are higher (or the risks are deemed lower). Remember the famous advert "Nobody ever got fired for choosing IBM"
You're judged by what you do rather than what you say. How frustrating is the phrase "your call is important to us, please hold" when you've been holding for 30 minutes! For more advice, visit our page on Sales Training. We hope that you find these tips useful. Happy selling!